Your website will benefit from a hosting platform that is powered by PHP and NGINX, and fine-tuned specifically for WordPress with 2GB guaranteed RAM and 360 Gbit/s fibre connectivity. With Managed WordPress Hosting from 1&1 IONOS our customers can create and update customised blogs with ease. Automatic updates of the latest versions and security updates means our customers' websites are always fast and protected. The domain of WordPress is the blog (short form "weblog"). The software was originally developed for the creation and management of the "internet diary". 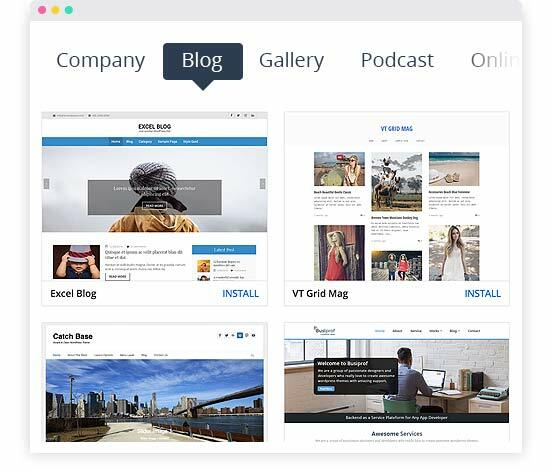 The software makes it extremely easy to set up, manage and maintain blogs as well as complex websites with and without an online shop, thanks to suitable extensions. Opt for WordPress hosting in the UK with 1&1 IONOS and start your blog today! Bloggers are the typical target group for WordPress; the content management system was primarily developed with blogs in mind. It is one of the most popular CMSs in the blogosphere. Both small and large companies and agencies benefit from its flexibility. From company websites and portfolios to brand showcases and online shops, just about any project can be realised with the popular CMS. Why is a special service required? With the popular Content Management System (CMS), you can design, manage, and publish blog articles or website content easily and intuitively. Thanks to professional WordPress hosting with an experienced provider like 1&1 IONOS, you can combine such features with a comprehensive technical service for good value. To put it simply, there is no need for you to invest in a powerful and secure server infrastructure, but rather rent one so that you can spend more time on your WordPress blog. We take care of the maintenance and security for you, and keep the technical infrastructure up to date. Install WordPress in just a few clicks. Once the setup is complete, start on the design and content of your blog. The 1&1 IONOS WordPress wizard will guide you step-by-step through this process and if you have any questions, our support team is available around-the-clock via telephone. The quality of the hosting service plays a very important role. Therefore, we have optimised our service especially for WordPress, making your content available within seconds. This saves your website visitors time spent on loading times and has a positive effect on the Google ranking of the site as fast-loading pages rank better than slow ones. With that in mind, there are plenty of convincing reasons for opting for WordPress hosting with 1&1 IONOS UK. What are the benefits of a managed WP hosting in the UK? With the 1&1 IONOS WordPress wizard, you can choose from many free themes (design templates). With Click & Build, the installation process is particularly easy. Simply choose your target domain and set up an administrator account, and the Click & Build system will take care of the rest. Now you can start setting up your blog right away. Create websites, shops and forums quickly and easily with WordPress. With many suitable themes, plugins and widgets, you will be ready to go in no time. As an experienced provider with an up-to-date IT infrastructure, 1&1 IONOS ensures high performance and optimum security. Fast and reliable SSD drives save your files and databases and ensure short and secure access time. The customisation possibilities of both varieties are identical. 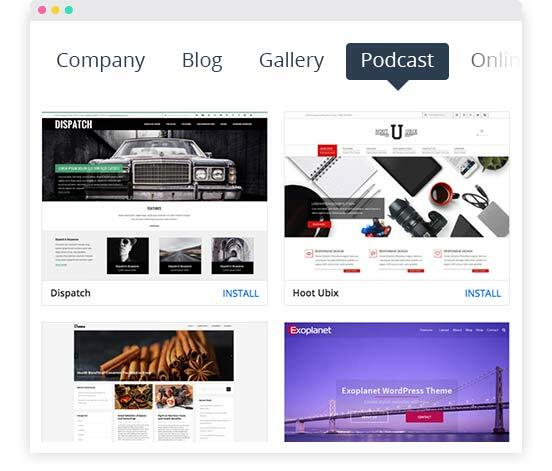 Users can install the same plugins, themes and widgets that are also available with other hosting providers. By choosing WordPress web hosting with 1&1 IONOS, you can concentrate on the essentials: a suitable design for your website and first-class content for your brand new digital adventure. We will look after everything else. Depending on the type of project, we suggest a functional WordPress template that best suits you. Whether a photo blog, a portfolio or a text-heavy blog, there is a suitable design template for every format. Simply select your preferred template and activate it with just the click of a mouse. Additionally, you have the possibility to switch from a WordPress hosting tariff to one of our free tariffs at any time – however, with the free version, you are responsible for your own updates. How diverse are the possibilities for customisation? When creating a WordPress blog, you can customise and develop it however you like. Due to its open source nature, users from around the world both create and share new extensions (plugins) and usually make them available for free. When opting for WordPress hosting, you need to decide what exactly your website should offer its users. Next, you choose the suitable extensions and simply plug them in, so to speak. Looking to start your own online shop? Then you will require plugins and themes with which you can present products appropriately and integrate payment methods. Our WordPress hosting package offers secure and high performance solutions in this respect. With the right plugins and themes you can also easily set up a forum. Forums require a quick connection to a MySQL database, regular backups and a traffic flat rate – all of which is offered by 1&1 IONOS WordPress hosting UK. The answer to both questions is: yes. The Gutenberg editor is available as a plugin and can be installed at any time with just a few clicks. All of the WordPress themes offered by 1&1 IONOS are compatible with the Gutenberg editor. Try it out and enjoy using WordPress even more easily and comfortably than before. Install posts and pages or build a whole new website, shaping your online site to your needs and requirements. Should the Gutenberg editor not satisfy you, you can switch back to the Classic Editor at any time – or use another editor in its place, which can be just as easily integrated by plugin into your WordPress installation.